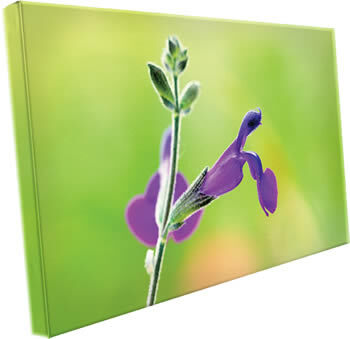 Description: Canvas pictures have this name because of the material they are printed on. Canvas is a texture of white fabric that mimics the perfect canvas pictures that can be used with printing ink. A canvas printing can be made from any picture in your archive or from the client and the main feature of this type of picture is the fact that a frame is not required. It is directly printed on a canvas, which is stretched on a rectangular wooden support, and it sticks to its thickness, being stapled at the back. The edges of the picture that will become part of the thickness can be left white, black or by keeping the colors in the picture. Once the printed canvas is stretched and fixed onto the wood, so the final picture is varnished, a special solution for paintings that forms a protective film is put on the surface of the printing, thus gaining a greater resistance over time. Finally you can add a wall hanging. Both linen canvas and varnished one are found in stores online and offline. The prices are approximately for the canvas cloth between 10-15 euro / sqm, and the varnish 5 euro/100 ml. Also it is necessary to achieve a printing canvas print performance. The price for a performance plotter, which prints on canvas, is somewhere around 1000 euros, but you can find ads and more affordable prices. Canvas pictures are made for many types of clients and events, with abstract art offers or digital copies of famous paintings, to personal photos or pictures for a custom client. - The investment is small and quickly pays for itself, basically a small canvas printing exceeds several times the price of a square meter of canvas cloth. Cons: - if great emphasis is put on promoting both online and offline, this business does not have disadvantages. - Promote offline, by means of prices, participating to as many events and providing as many cards. Conclusion: A business of this kind can be done easily in your home, and because of the Internet, orders and even pictures that customers want to transform into canvas paintings can be taken easily. Orders can be met everywhere by courier. 0 Response to "Business Ideas : Digital canvas pictures"